War is big business. Since the start of Syria’s civil war in 2011, conflict traders have worked with regime and rebel commanders to take control of natural resources and markets, often giving rise to bizarre joint ventures between avowed enemies. 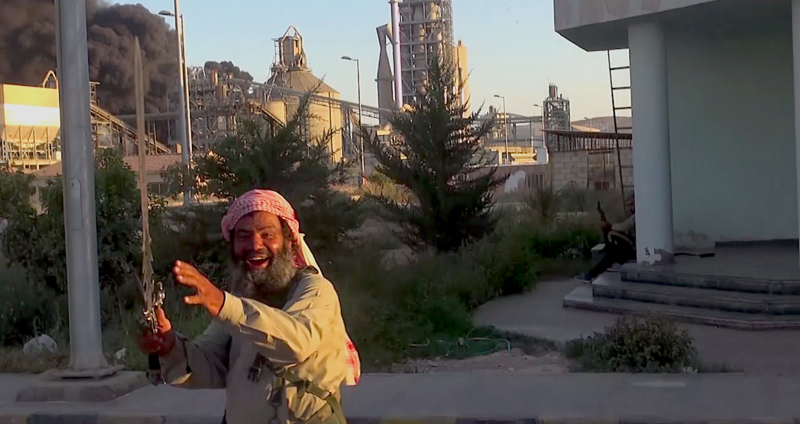 As Lafarge struggled to save its $680-million cement plant near Raqqa, factory managers were simultaneously paying anti-Western jihadis, U.S.-backed rebels, Kurdish nationalists, and Assad’s government. Even as they fought each other, all had an interest in continued business. Though Lafarge was forced to shut down their Syrian operations in 2014, the strategy worked, leaving the factory near Raqqa largely undamaged. As a result, the plant could become a key resource for the rebuilding of Syrian cities like Aleppo, Raqqa, and Kobane—but that would likely require more deals among rival actors. The Lafarge case allows us to dissect the Syrian war economy and its implications for Syria’s future, now that the country is moving toward a reconstruction stage even as divisions between Assad-ruled Syria and the U.S.-backed Kurdish region persist. At least one of the tools for reconstruction is within reach. An hour and a half’s drive from Raqqa lies one of the largest and most modern cement plants in the entire Middle East, opened less than a year before the war by the multinational construction giant LafargeHolcim. If production were to be resumed, the factory would be perfectly positioned to help rebuild bombed-out cities like Raqqa and Aleppo. However, although the factory may well hold one of the keys to Syria’s future, it also has an unseemly past. The strange story of how the world’s most hated extremist group allegedly ended up receiving payments from the world’s largest cement company is worth a closer look, not just for what it tells us about the way money fuels conflict, but also for what it can teach us about Syria’s war economy—a vast ecosystem of illicit profiteering, where the worst of enemies are also partners in business. This work was supported, in part, by a research grant from The Harry Frank Guggenheim Foundation, and by the Carnegie Corporation of New York. It draws on interviews with Syrian and international experts, diplomats, fighters, and people involved with Lafarge’s operations in Syria, as well as on a wide range of written sources in English, Arabic, French, and Norwegian, including press coverage, company reports, memoirs, and social media. Lafarge’s behavior, which is now under investigation in France and could result in criminal convictions, was far from exceptional for companies operating in civil-war Syria—or perhaps in any similar war zone.4 The need to consider opportunistic compromises, dubious deals, and under-the-table payoffs to criminal and violent actors to keep Lafarge’s factory in operation will therefore also be difficult to avoid for others hoping to operate in Syria’s fragmented politico-economic landscape. The fact that President Bashar al-Assad’s government is now clearly dominant and the Syrian war seem to be moving toward a reconstruction stage will only exacerbate the problem.5 The fighting is far from over and the country remains divided, with rival armed actors ruling several peripheral areas. The most important one is the northern, Kurdish-controlled region propped up by the United States. As long as these divisions remain in place, many humanitarian and commercial actors will be forced to work under two or more rival regimes, negotiating a path among militant actors who routinely prey on industry, trade, and relief operations. During the war, a new class of conflict traders has emerged to facilitate cross-line connections of this type. Though they hail from different backgrounds and areas, most retain strong links to Assad’s government. As reconstruction money starts pouring in, it will be near-impossible to avoid some level of dependence on these regime-connected fixers and war profiteers—the new kings of Syria’s economy, whose power grows as the Syrian army advances. 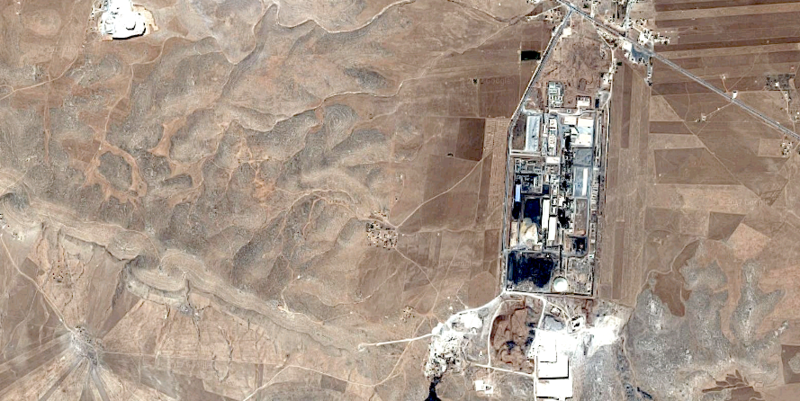 Map of northern Syria with Lafarge’s factory near the center. Ayn al-Arab is another name for Kobane. Source: CIA. One of the ways in which members of the ruling elite skimmed money from private enterprise was by attaching themselves to wealthy investors. Foreign companies looking to enter the Syrian market were obligated to work with a local partner, often in the form of some regime-friendly oligarch or military surrogate whose main contribution to business would be to grease the most relevant palms and show teeth to rival predators. It was into this economy that the French cement giant Lafarge waded in December 2007, by acquiring its Egyptian competitor Orascom Cement at the eyebrow-raising price of $12.8 billion.10 It was a bold move, and since the global economic crisis struck immediately after, many wondered whether the affair had perhaps been a terrible error—but Lafarge appeared determined to recoup that money and more by breaking into new Middle Eastern markets. The Jalabiyya factory. Source: LCS Facebook page. At $680 million, LCS would be responsible for Syria’s largest-ever foreign investment outside the oil sector, representing more than a tenth of the country’s state budget at the time.12 Its production capacity of three million tons per year was vastly higher than any of Syria’s six government-owned cement plants, which, typically for the Baathist state’s bloated and decrepit public sector, only managed to churn out 5.3 million tons combined in 2008—well short of demand.13 In every way, this was a big deal. The site chosen for the LCS plant, Jalabiyya, gave no hint of the grand plans drawn up for its future. Had the outside world not made its presence felt in the form of traffic roaring along the east-west M4 highway, this would have seemed the middle of nowhere. The closest human settlement was Khorrab Asheq, a miserable little Kurdish hamlet just across the M4, which had about half as many inhabitants as the up to 700 people employed at the factory. Jacob Waerness, who worked as LCS risk manager 2011-2013. Source: Pax Publishing. Formally, Jalabiyya belonged to the Aleppo governorate. In reality, this far-flung spot of grass and rocks shared little with the three-million-strong metropolis to its west. For all practical purposes, Jalabiyya was part of the Jazira, an ethnically mixed rural region of Bedouin Arabs, Kurds, and Syriac Christians that stretches through Syria and Iraq along the Euphrates and Tigris rivers. The arrival of LCS seemed set to change that—and it fit perfectly into Bashar al-Assad’s vision for how Syria should move away from state socialism and find a new economic footing. With a nod to the war then raging next door in Iraq, Dardari had proposed public investments in Jazira cities like Raqqa, which he hoped could become a “rear base for Iraq’s reconstruction.”17 Improving ties with Turkey also resulted in growing cross-border commerce, accelerated by a major free trade deal in 2007. As northern Syria readied itself for a construction boom, the future looked bright for business—and there was clearly money to be made in cement. If money was to be made, strings had to be pulled. For that, Lafarge turned to its new local partner, MAS. It seemed a good fit for the role, as one of Syria’s leading conglomerates, with a varied portfolio of interests and an insatiable appetite for expansion. Firas Tlass during a 2013 interview with al-Arabiya television. Source: Al-Arabiya. An iconic representative of the awlad al-sulta, Firas Tlass was born into a military family from Rastan, near Homs, in 1960. Twelve years and four coups later, his father Mustafa was appointed Syria’s minister of defense, having helped his old friend Hafez al-Assad to seize power in 1970. Although Mustafa Tlass would be kept in the job for an incredible thirty-two years, his position had become “increasingly ceremonial in nature” already by the late 1970s.19 But even without the political clout to match his gilded titles, Tlass’s decades-long friendship with the president made him untouchable to rivals, never mind to the judiciary. Tales of personal and financial improprieties began to pile up. Several of Mustafa Tlass’s relatives rose to leading positions in the military, most notably his son Manaf, who became a brigadier general in the Republican Guard.21 But his oldest son, Firas, chose another path—he decided to try his hand at business. Having someone like Firas Tlass on the board of LCS meant that the Syrian government would rally behind the company, seeing that one of its own had put money down for its success. Some 400 kilometers north, the Jalabiyya factory had grown into an imposing complex of silos, towers, masts, and conveyor belts, its highest structures looming 130 meters high over the flat countryside. Four kilometers of concrete walls surrounded the site, and LCS had even brought in Chinese contractors to build and operate its very own coal-fueled power plant. Satellite image of the Jalabiyya factory. Source: Google Maps. Cement sales worked according to a business principle called “ex works,” meaning that LCS simply made pre-packaged cement available for pickup at the Jalabiyya warehouses, while assuming no responsibility for transports, onward distribution, or future sales. Customers would collect the product using their own drivers and cars. The top buyers were construction companies with distribution networks that could span several cities, though the factory also sold to small, independent customers. Barely had the LCS plant opened before things fell apart. In March 2011, protests against the Assad family’s four-decade rule erupted in southern Syria. A year later, thousands of people were dead and fighting raged across the country. Lafarge chose otherwise. In 2011 and early 2012, LCS had not yet been touched by the unrest that plagued other parts of Syria. The risk of tripping over American or European financial restrictions was a concern, but sanctions did not target the cement business.38 There was no pressure to leave from the Syrian government, which, to the contrary, wanted the factory to stay, being eager to project an air of normalcy and secure continued LCS tax payments. As a compromise of sorts, Lafarge ordered LCS to hire a risk manager, Jacob Wærness, who was sent to Syria to work under the Damascus-based administrative director Marc Castel. In July 2012, the violence percolating across northern Syria burst into all-out war around Aleppo. Turkish- and Qatari-backed rebels seized the eastern neighborhoods of the city, prompting the Syrian army to withdraw from the mostly Kurdish-populated northeastern hinterland in order to safeguard the major cities. In nearby Arab-majority cities like Manbij, a number of very different groups filled the void. Most hewed to some form of Sunni Muslim identity, mixed with Syrian nationalist themes. Although many referred to themselves as members of the Free Syrian Army—a term loosely associated with state-funded, non-jihadi factions—they lacked a common military hierarchy. At the time, however, LCS worried more about crime. With gangs of armed men of uncertain allegiances now roaming the northern countryside, road travel was becoming increasingly dangerous, especially at night. This was a problem for workers at Jalabiyya, who needed to travel back and forth between the factory and their homes, and who had to go to government-held Aleppo to collect salaries paid out through local banks. It was also starting to hurt daily operations. Sales depended on dozens of trucks being able to arrive safely every day to pick up cement, with drivers sometimes carrying very large amounts of cash. LCS managers were also increasingly worried that Jalabiyya itself could come under attack, since news had spread about opposition fighters looting factories and businesses in Aleppo. In the latter half of 2012, this did not seem like an impossible task. The YPG was a well-disciplined force whose commanders seemed protective of the factory, and the group was strong enough to keep most rivals at a distance. As long as road travel could be minimized, the situation would perhaps be bearable. A lone, blonde Norwegian, Jacob Wærness must have seemed madly out of place in the spiraling chaos of northern Syria, but he insists that he felt safe behind the walls of the factory. From his new home at the LCS plant, he launched a program of outreach to the armed groups of the Aleppo-Raqqa region, hoping to quickly figure out who was who, who would be a threat, and who could offer help. At the top of the list was of course the YPG, which controlled the region around the factory. According to Wærness, after making contact through a Damascus-based associate of Firas Tlass, who appears to have moved swiftly to purchase goodwill, the YPG leaders explained that they wanted the company to stay and continue production; a cement plant would be an excellent addition to their future autonomous region. Even so, local commanders sometimes took matters into their own hands, and the relationship was far from pleasant for LCS and its employees. Relations with the Arab rebels were normally less intense, since they were farther away and therefore had a weaker hand to play against LCS, but all interactions with the rebels were also more fraught with danger. Unlike the YPG, the Arab militias had no central command that could keep criminal or extremist elements in check, and relations among the local commanders fluctuated unpredictably. To make matters worse, according to Wærness, word quickly spread across the region that LCS was paying protection money to the YPG. Some rebels became angry and hostile, since they saw the Kurdish group as an enemy. Others were tempted to reach for a slice of the pie. As he began reaching out to Syria’s rebels in early autumn 2012, Wærness relied heavily on Firas Tlass, who had by then transformed himself from regime tycoon to high-end opposition fixer. According to Wærness’s account, Firas Tlass’s interventions appear to have taken three forms: (1) he helped negotiate deals over raw materials, (2) he facilitated Wærness’s work by putting him in touch with rebel leaders, and (3) he paid protection money to armed groups so that they would leave the factory and its transports alone. A look into the public record seems to confirm this account. Wærness told them about the factory’s situation and said LCS wanted to stay out of the war and continue making cement. The commanders nodded and agreed, and several of them quickly came up with plans for how to protect the factory, generally involving some form of LCS sponsorship for their faction. Islamic State jihadis take the factory in September 2014. Source: Islamic State propaganda video. Even as LCS moved deeper into the darkness of the Syrian war economy, Firas Tlass’s connection to the company was becoming weaker—or at least more obscure. Though Syrian authorities had taken custody of MAS in 2012–2013, Tlass remained on the board of LCS until the beginning of 2014 when, according to a company spokesperson, he left “for reasons unrelated to Lafarge.”97 In August 2014, the Syrian Ministry for Internal Trade and Consumer Protection announced that MAS had been formally transferred to state ownership, which meant Assad’s government now controlled a 1.33 percent share in LCS.98 LCS’s various streams of payment to Tlass appear to have dried up in July and August. The timing may suggest that LCS simply responded to the Syrian ministry’s decision by pushing Tlass out of the company. But that isn’t necessarily so, because there was another excellent reason to stop paying Tlass at this time: in September 2014, cement production at Jalabiyya ended. 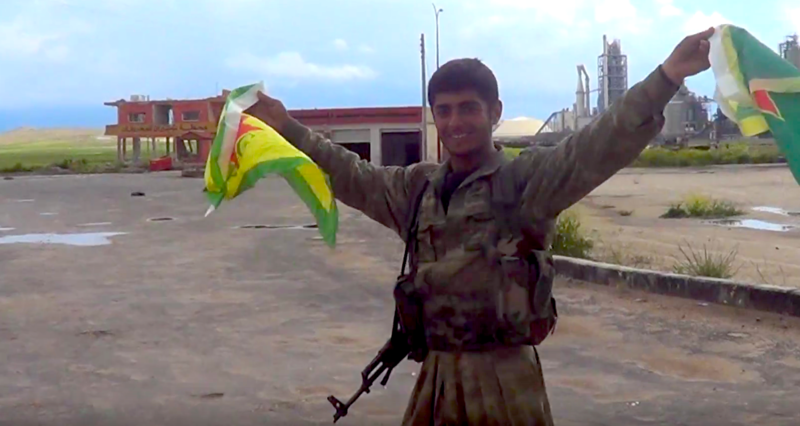 A fighter waves YPG flags during as Kurds return to the area in 2015. Source: YPG propaganda video. If that was the plan, it didn’t work. Just like those secular Syrian opposition members who had tried to ride the jihadi tiger, Lafarge would soon find it turning against them. Jalabiyya was increasingly exposed, but LCS representatives continued to haggle with the jihadis over the protection of employees, rights of passage, and raw materials. However, once the Islamic State moved to finish off the YPG, it was over. The Jalabiyya factory in autumn 2014. Source: Islamic State propaganda video. Safely embedded in a YPG-controlled autonomous region called the Democratic Federation of Northern Syria, the LCS plant at Jalabiyya appears to have survived the war—physically, at least. It no longer seems to be at risk of attack. Later that year, human rights activists and former LCS employees launched a lawsuit against Lafarge.118 In the lawsuit and in press reporting, the company has been accused of financing the Islamic State and the Nusra Front, violating EU sanctions by buying Syrian oil, and endangering its employees by failing to organize an orderly evacuation.119 French authorities initiated an investigation in October 2016. That plan, too, has worked out poorly. Yet, the most important thing to understand about Lafarge’s Syrian misadventures is perhaps that they were not unusual at all. By bending to threats and trying to appease all sides, LCS seems to have acted like most Syrian companies—and beyond questions of right and wrong, this sordid affair provides us with an instructive glimpse into Syria’s murky war economy. Instead, the old structures have mutated and blended with new networks of illicit enrichment, many of them sprouting among foreign-backed rebels, jihadis, and Kurdish forces. In this oligarchy of violence, commercial actors compete both more openly and more violently than in the pre-2011 era, when transactions took place under the umbrella of the police state. Even as Syria’s rebels, Kurdish nationalists, and Assad loyalists fight and kill each other, they trade. A veritable army of political fixers, entrepreneurs, and smugglers has emerged to provide the connective tissue binding this fragmented nation into one single, happily pumping vascular system of corruption. In some ways, this is nothing more than market forces doing their thing in a business environment regulated by military power rather than by laws and bureaucracies. And tellingly, many of Syria’s most successful conflict traders are not veterans of the battlefields, but of the boardrooms. Though there are many of these conflict traders,130 the most well-known figure working Syria’s political gray zones may be George Heswani, a Damascus-based businessman with close links to Assad’s circle and to economic interests in Russia. Whether any of this seems scandalous will likely depend on one’s ability to disregard the obvious: everyone in Syria needs oil, and, for a year or two, the Islamic State controlled most of the oil in Syria. The list of buyers consequently included Assad’s government, the YPG, the Nusra Front, all manners of rebel factions and other Islamists, and even, it would seem, a French cement maker—that is, everyone. One may choose to view this as a grand conspiracy or simply as the invisible hand of the market being busily at work. More prosaically put, it is perhaps how the economy would operate in any war zone where rival factions control interdependent resources. The conflict won’t be over soon, and Syria may remain a divided country for a long time—maybe indefinitely. But with Bashar al-Assad’s government no longer facing a serious threat either from foreign-backed Sunni Arab rebels or independent jihadis like the Islamic State, and with full-scale fighting between Assad’s forces and the Kurds unlikely due to Russian-American deconfliction agreements, a corner seems to have been turned. To rebuild Syria and provide even the most rudimentary conditions for refugee return, Assad will need UN assistance. His own allies are traditionally stingy aid donors, or poor, or both, and the vast majority of funds for a credible reconstruction program would almost certainly have to come from wealthy nations like the United States, EU members, Norway, Switzerland, Japan, Canada, and the Arab oil states, most of whom oppose Assad’s rule. Still, many of these nations remain eager to do something, whether for humanitarian reasons or to stem the flow of refugees from Syria. The emerging “third way” solution is to maintain economic pressure on the Syrian central government, while directing reconstruction funds to areas outside of Assad’s control. 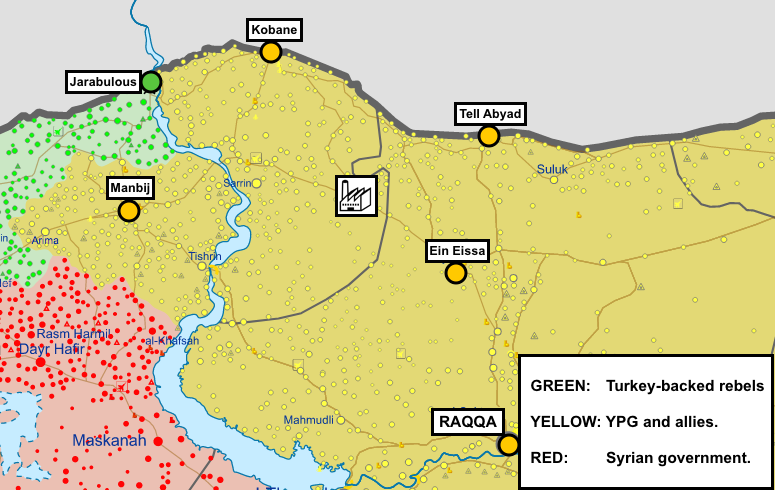 The biggest such area, perhaps the only one that could be truly viable, is YPG-held northeastern Syria. This region also benefits from fears among Western nations that the Islamic State could respawn among the hundreds of thousands of desperate Sunni Arab civilians who live in the area, displaced by the fighting and often resentful of Kurdish rule. In terms of institutional capacity and resources for reconstruction, the YPG and its allies are much worse off than the Syrian government. But unlike Assad, the Kurds have spent the past few years making friends among the world’s wealthiest nations. The United States has announced that it will remain in the Syrian Kurdish region for the foreseeable future, protecting it from both Turkey and the Syrian government. American officials point to a need to continue suppressing the Islamic State, but also say they hope to leverage the oil, water, and agriculture of northeastern Syria to persuade Assad to resign and his Iranian allies to exit Syria. That’s fanciful, but, nevertheless, it seems to be the strategy currently at work. Endowing northeastern Syria with a functioning economy and decent governance is intrinsic to any such strategy. Unless the area can get back on its feet, provide public services, and create jobs, it cannot be a reliable protector against renewed instability, much less hold its own when bartering over resources with Syria’s central government. What that means is that U.S. diplomats and USAID workers will deploy to Syria to help supply short-term necessities and security-related items such as training and equipment for de-mining, rubble-clearing, electric power, clean water, and the standing-up of internal security forces and border patrols.145 Reconstruction, which the U.S. government will not support, would involve rebuilding Raqqa and other cities, organizing a comprehensive return of displaced civilians, developing a functioning local economy, creating jobs, and supporting credible, permanent governance structures. In other words, at least some rebuilding is going to take place in northeastern Syria, in isolation from Assad’s government. Whether it stops at very basic efforts or shifts into a full-blown reconstruction program, one thing is certain: it will require a lot of cement. A LafargeHolcim spokesperson says the company has no plans to return to Jalabiyya. That may be LafargeHolcim’s current position, but it is unlikely that the company has given up entirely on its Syrian assets. Apart from having been commandeered by the U.S. government, the Jalabiyya plant seems to have suffered little structural damage.148 With some repairs and a reassembled workforce, it could likely be restarted quickly. Smoke from a burning fuel storage rises above the Jalabiyya factory in September 2014. Source: Islamic State propaganda video. As things stand, the security situation in the Jalabiyya region is better than at any point since 2011. Since last autumn, the area between Raqqa, Manbij, and Kobane is entirely controlled by the YPG and its local Arab and Syriac allies, who have declared themselves the army of a Democratic Federation of Northern Syria.149 This internationally unrecognized but increasingly real political entity is watched over by what is in the Syrian context an invincible power: the U.S. Air Force. To be sure, there are rival forces not far away. The Syrian army, which is just as untouchable due to protection from the Russian Air Force, has consolidated control in Aleppo and south of Raqqa. Turkish troops are embedded among Arab and Turkmen rebels west of the Euphrates, in a triangle stretching from Jarablous to al-Bab and Azaz, north of Aleppo. They are currently fighting YPG forces to the northwest of Aleppo, in the Efrin enclave. But neither Assad’s government nor Turkey and its rebel clients could punch through the YPG to take Jalabiyya in the east, unless the United States decides to let them. The Democratic Federation of Northern Syria is at this point large enough to provide safe land connections from Jalabiyya to most of the relevant markets and sources of raw materials. There are open roads to the pozzolana quarry outside Raqqa, to the hydroelectric dam at Tabqa, to several major Syrian oil fields, to the Iraqi border, and to Qamishli, from where there is regular air traffic to Damascus. Cement could reach Manbij, Kobane, Raqqa, Hassakeh, Ras al-Ein, Amoude, and Qamishli, without crossing into anti-YPG territory. Then again, YPG-backed authorities do not seem capable of running the factory on their own, even if LafargeHolcim were to reinvest in the area. The Democratic Federation rests on shaky legal ground, since it has no international recognition (not even from its sponsor, the United States) and it has only limited administrative and institutional capacity. In fact, Kurdish-controlled northern Syria remains dependent on Assad’s government, which still controls much of the bureaucracy in the northeast. Even under overall YPG control, state employees continue to administer public services, salaries, and pensions, and they and other loyalist actors have a hand in the Kurdish region’s educational sector, health care, air travel, financial services, and oil and gas extraction—the YPG’s lifeblood. The Jalabiyya factory would likely also need at least some resources brought in from the coast or other army-controlled areas, which could give Damascus even more influence over its operations. In other words, for the factory to restart under YPG control, the Assad government and/or allied traders would almost certainly have to approve and be adequately rewarded. Damascus wouldn’t necessarily mind. Assad, too, has an interest in reviving the economy and restarting the northern cement trade, especially if that helps him rebuild Aleppo. If making a deal over Jalabiyya with the Kurds could also restart the flow of tax payments from LCS to state coffers, and allow his government to publicly welcome a European multinational back to Syria, so much the better. And the Syrian leader will want to tread carefully in his dealings with the Kurdish region, finding a middle course between empowering it too much and allowing it to spin off into isolation under U.S. tutelage. Making sure that government institutions and loyalist businessmen remain intimately involved in Syrian Kurdistan’s strategic industry may be his best way to preserve long-term leverage and discourage separatism. Another possibility, of course, is that the United States will decide to use its military and economic might to help the YPG sidestep Damascus. U.S. officials appear to be well aware of the role the Jalabiyya factory could play for reconstruction, and, if they really want to, the Americans could certainly muster the necessary expertise, financial muscle, resources, and logistics to cut Assad and his allies out of its operations. Such interventions in the local economy would help expand the the Democratic Federation’s autonomy from Damascus, and they would seem to fit well with the U.S. strategy of weakening Assad by economic means. But they also run up against the stated U.S. reluctance to nation-build, not to mention that any attempt to delve deeper into the Kurdish economy would spark Turkish protests and attempts at obstruction. How LafargeHolcim fits into these scenarios remains to be seen. Whether convicted of terrorism financing or not, the Swiss-French company retains 98.67-percent ownership of LCS and thus also of the factory at Jalabiyya. The remaining 1.33-percent share that formerly belonged to Firas Tlass has been confiscated by the Syrian government, but LafargeHolcim seems to be in no hurry to crack open that can of worms. Very likely, the company will simply wait to see which way the wind blows before deciding whom to consider the legitimate authority over northeastern Syria. Map of the political situation in January 2018. Source: Wikipedia, modified by author. Before 2011, corruption in Syria manifested itself through politically engineered state–business partnerships and, increasingly in Bashar al-Assad’s era, an untouchable caste of regime-linked private-sector tycoons. During the war, it has mutated into a many-headed hydra of armed actors running their own rent-seeking operations and trade networks. The continued need for trade and other exchanges across military front lines has given rise to a new niche for fixers and conflict traders who interpose themselves between the warring parties. One could argue over whether it was morally acceptable or not for Lafarge to continue doing business in such an environment. On the one hand, the company fed money into the illegal economy and paid armed groups. On the other hand, ordinary Syrians needed cement for a variety of legitimate and even laudable purposes—how else to rebuild bombed hospitals?—and this was the only realistic way to continue producing it. Either way, it was likely impossible to continue working at Jalabiyya in a way that also conformed to the legal requirements under which a European company operates. Lafarge is now suffering the consequences of its attempt to skirt that fundamental contradiction. Similar dilemmas will apply to a great many other commercial actors in Syria, as well as to humanitarian organizations that need to reach across the front lines in order to reach vulnerable civilians. All of them are sure to be watching the outcome of the French investigations for clues on how to adjust their own relationships among Syria’s economic middlemen and armed actors. These issues are taking on an added importance given that outside actors are now deliberating ways to spend reconstruction money in Syria. An influx of foreign aid money into a still-divided country would further modify the economic relationships formed during the war, possibly reinforcing the role of those mostly regime-linked middlemen who hold the keys to particular types of cross-line trade. Should American and European policymakers double down on their investment in the Democratic Federation of Northern Syria even as Assad consolidates control over most of the rest of Syria, the country may end up being informally partitioned for the foreseeable future. Each Syrian region would then be more or less politically independent of the other, yet they would undoubtedly remain linked by residual institutional ties and informal trade networks that, for the most part, run back to Damascus. It would ensure many more years of good business for Syria’s conflict traders, potentially empowering them vis-à-vis the central government and its institutions while, paradoxically, also helping Assad maintain a degree of influence over the Kurdish leadership. In the longer term, the future of northern Syria is highly uncertain. But if local and international interest continues to drift in the direction of reconstruction, that little spot of windswept grasslands in Jalabiyya may well assume a new importance. Even as the cities around it lie in ruins, there it stands, nearly untouched by the war, a silent monument to the power of money: Lafarge’s giant cement plant, waiting for another handshake across the front lines. Editor’s note: This report was updated on February 21, 2018, to reflect new information regarding the charges against Firas Tlass. Linda Tom, a Damascus-based official with the UN’s Office for the Coordination of Humanitarian Affairs (OCHA), told me in October 2017 that more than four-fifths of Raqqa city had been rendered uninhabitable. For more, see Aron Lund, “The Islamic State Is Collapsing, but Raqqa Is in Ruins,” The Century Foundation, October 18, 2017, https://tcf.org/content/commentary/islamic-state-collapsing-raqqa-ruins; Aron Lund, “Winter is coming: Who will rebuild Raqqa?” IRIN News, October 23, 2017, https://www.irinnews.org/analysis/2017/10/23/winter-coming-who-will-rebuild-raqq. The French company Lafarge and Switzerland’s Holcim merged in 2015 to create LafargeHolcim. “Holcim and Lafarge complete merger and create LafargeHolcim, a new leader in the building materials industry,” Lafarge, October 7, 2015, www.lafarge.com/en/holcim-and-lafarge-complete-merger-and-create-lafargeholcim-a-new-leader-building-materials-industry. “Top Lafarge executives, including former CEO, indicted on terror financing charges,” France 24, December 9, 2018, www.france24.com/en/20171209-senior-lafarge-executives-including-former-ceo-indicted-terror-financing-charges. Liz Alderman, “Lafarge Scandal Points to Difficulty for Businesses in War Zones,” New York Times, April 24, 2017, https://www.nytimes.com/2017/04/24/business/lafarge-ceo-syria-cement.html. Aron Lund, “Rebuilding Syria’s rubble as the cannons roar,” IRIN News, March 8, 2017, https://www.irinnews.org/analysis/2017/03/08/rebuilding-syria’s-rubble-cannons-roar. Transparency International ranked Syria among the Arab world’s most corrupt countries in 2010. Syria shared 127th place on the list with Lebanon, and of the five Arab states that ranked worse—Mauritania (143), Yemen and Libya (146, shared), Sudan (172), and Iraq (175)—three were in the midst of violent conflict and one had suffered a different kind of disaster: being ruled by Colonel Gaddafi for the past half century. For the full report, see “Corruption Perceptions Index 2010,” Transparency International, 2010, https://www.transparency.org/cpi2010/results. Or “children of authority” in the translation preferred by Salwa Ismail, “Changing Social Structure, Shifting Alliances and Authoritarianism in Syria,” in Fred Lawson (ed. ), Demystifying Syria (London: Saqi Books, 2009). Bassam Haddad, Business Networks in Syria: The Political Economy of Authoritarian Resilience (Palo Alto, CA: Stanford University Press, 2012), p. 76. In the pre-war period, Rami Makhlouf was so widely loathed among ordinary people in Syria that the United States saw sanctioning him as a way to win Syrian hearts and minds. See for example “Maximizing the impact of Rami’s designation,” U.S. diplomatic cable released by Wikileaks, 08DAMASCUS70_a, January 31, 2008, https://wikileaks.org/plusd/cables/08DAMASCUS70_a.html. Author’s interview with Riad al-Turk, Damascus, January 2008. “Lafarge to Buy Orascom Cement for $12.8 Billion,” Reuters/CNBC, December 10, 2007, https://www.cnbc.com/id/22178287. Orascom and MAS had originally created a company called the Syrian Cement Company (SCC) to build the factory. It would be majority-owned by Orascom Cement with a minority stake of 25 percent left for MAS. When Lafarge stepped in, the name was changed to Lafarge Cement Syria (LCS). MAS’s share of LCS dwindled as Lafarge continued to put more money into the project. By the time the factory entered production, MAS retained 1.33 percent of the ownership of LCS. See “shuraka baina mas al-souriya wa-orascom al-masriyya li-iqamat masnaa lil-isment,” Syrian Days, May 3, 2007, www.syriandays.com/?id=2661&page=show_det&select_page=59. The U.S. Geological Survey Minerals Yearbook—2009, U.S. Geological Survey, https://minerals.usgs.gov/minerals/pubs/country/2009/myb3-2009-sy.pdf; “Lafarge Cement-Syria Starts Ops, To Hit Full Capacity ’11 -Report,” Zawiya, October 16, 2010, available at www.lafarge.com.sy/lafargeeng.pdf; The U.S. Geological Survey Minerals Yearbook—2011, U.S. Geological Survey, https://minerals.usgs.gov/minerals/pubs/country/2011/myb3-2011-sy.pdf; Ralph Atkins, Erika Solomon, and Michael Stothard, “LafargeHolcim’s reputation at risk over alleged links with Isis,” Financial Times, March 19, 2017, https://www.ft.com/content/406b06fe-05b6-11e7-aa5b-6bb07f5c8e12. Lafarge Cement Syria website (lafarge.com.sy) as captured on July 2, 2013, by the Wayback Machine, https://web.archive.org. The U.S. Geological Survey Minerals Yearbook—2008, U.S. Geological Survey,, 2010, https://minerals.usgs.gov/minerals/pubs/country/2008/myb3-2008-sy.pdf. A similar-sized plant (Al-Badiya Cement) was also being built by Saudi and European investors near Damascus, aiming to ensure a steady supply of cement to southern Syria, while LCS took charge of the north. Cement is heavy to move and sells cheaply per kilo, which reduces the effective range of sales. Together, these two plants were intended to more than double Syria’s cement-production capacity, making the country self-sufficient even in case of rising demand. Author’s interview with Jacob Wærness, phone, December 2017. Email to the author from Myriam Ababsa, December 2017. Myriam Ababsa, Raqqa: territoires et pratiques sociales d’une ville syrienne (Beirut: IFPO, 2009), p. 155. Available for free online at http://books.openedition.org/ifpo/1021. The author made multiple attempts to contact Firas Tlass up until publication, but received no response. Hanna Batatu, Syria’s Peasantry, the Descendants of Its Lesser Rural Notables, and Their Politics (Princeton, NJ: Princeton University Press, 1999), p. 226-227. Susanne Koelbl, “A 101 Course in Mideast Dictatorships,” Der Spiegel, February 21, 2005, www.spiegel.de/international/spiegel/syria-a-101-course-in-mideast-dictatorships-a-343242.html. There was also his nephew Gen. Talal Tlass, who remained loyal to the government and would in 2012 be appointed deputy minister of defense, and a host of younger, lower-ranking officers, such as Maj. Bashar Tlass, 1st. Lt. Mohammed Tlass, and 1st. Lt. Abderrazzaq Tlass, all of whom defected in 2011–2012 to join the rebellion. Salwa Ismail, “Changing Social Structure, Shifting Alliances and Authoritarianism in Syria,” in Fred Lawson (ed. ), Demystifying Syria (London: Saqi Books, 2009), p. 19; “The story behind the defection of Syrian general Manaf Tlas,” Al-Arabiya, July 9, 2012, https://english.alarabiya.net/articles/2012/07/08/225199.html. Email to author from Jihad Yazigi, Decethe mber 2017. On Yazigi, see Stephen Glain, “The Syria Report Survives as Independent Publication,” The New York Times, December 19, 2012, www.nytimes.com/2012/12/20/world/middleeast/the-syria-report-survives-as-independent-publication.html. The Syria Report can be accessed on http://www.syria-report.com. The name MAS is drawn from the abbreviation of Min Ajl Souriya, which is Arabic for “For the Sake of Syria.” The company markets itself as being more than a money-making enterprise, trying to appear as a patriotic agent of Syria’s economic development against nefarious foreign interests. Firas Tlass’s personal website described him as “a patron of the arts [known] for promoting freedom of thought and being a prominent member of the Syrian intelligentsia.” MAS Economic Group (www.masgroup.net) and Firas Tlass (www.firastlass.com). Both accessed via archive.org. France gathers world leaders for Bastille Day parade,” AP/The Independent, July 14, 2008, https://www.independent.co.uk/news/world/europe/france-gathers-world-leaders-for-bastille-day-parade-867282.html. “Total Signs Three Oil and Gas Agreements in Syria,” Total S. A., September 4, 2008, https://www.total.com/en/media/news/press-releases/syrie-total-signe-trois-accords-petroliers-et-gaziers; “Sarkozy’s visit yields victory for French oil company,” 08DAMASCUS646_a, Cable from the U.S. Embassy in Damascus dated September 15, 2008, released via Wikileaks, https://search.wikileaks.org/plusd/cables/08DAMASCUS646_a.html. “Bank Audi & Lafarge Cement Syria celebrate the successful closing of the Lafarge Cement Syria project finance facility,” Bank Audi, January 13, 2010, www.bankaudisyria.com/syria/newsroom/press/bank-audi-lafarge-cement-syria-celebrate-the-successful-closing-of-the-lafarge-cement-syria-project-finance-facility-english. Christian Chesnot and Georges Malbrunot, Les Chemins de Damas: Le dossier noir de la relation franco-syrienne (Paris: Éditions Robert Laffont, 2014), p. 227. Author’s interview with Beat Werder, head of media relations for LafargeHolcim, phone, December 2017. Fadi al-Alloush writing for Syria Steps, October 14, 2010, available at www.lafarge.com.sy/lafargeeng.pdf. See Jacob Wærness, Risikosjef i Syria: På jobb mellom regime, opprørere og IS (Oslo: Pax, 2016). Discriminatory measures such as the ban on Newroz celebrations and the denial of citizenship to many Kurds were hastily revoked in early 2011. To many Kurds, this was a welcome change, but about half a century too late to seem sincere. On anti-Kurdish laws and repression in pre-2011 Syria, see Harriet Montgomery, The Kurds of Syria. An existence denied (Berlin: Europäisches Zentrum für Kurdische Studien, 2005), and Jordi Tejel, Syria’s Kurds: History, politics and society (Abingdon, UK: Routledge, 2009). Clara Portela, “The EU’s Sanctions against Syria: Conflict Management by Other Means,” Security Policy Brief No. 38, Egmont Royal Institute for International Relations, September 2012, aei.pitt.edu/39406/1/SPB38.pdf. Eric Watkins, “Total exits Syria following tightened EU sanctions,” Oil & Gas Journal, December 7, 2011, www.ogj.com/articles/2011/12/total-exits-syria-following-tightened-eu-sanctions.html. “We wanted to continue to operate the factory as long as we didn’t break EU, UN, or U.S. sanctions,” says Jacob Wærness, who had started his work as risk manager for the factory in September 2011, shuttling back and forth between Jalabiyya and Damascus. “They all published sanctions lists regularly, so we read those and found that we weren’t in violation of any of these sanctions.” Wærness, interview, 2017. “I don’t think we thought a lot about post-conflict business in the beginning, because we didn’t know at the time that there would be such devastation,” argues Wærness. “It was more that we knew that if we abandoned the factory, it would be ruined, robbed, taken apart, used as a base by the opposition, and so forth.” Wærness, interview, 2017. In 2012, employees are said to have tried to conceal from factory managers that they were being stopped and questioned in rebel checkpoints on their way to work, fearing that Lafarge would order a pull-out if the situation seemed too insecure. Wærness, Risikosjef i Syria, 2016, p. 88f. Wærness, Risikosjef i Syria, 2016, p. 211. On the Syrian-PKK relationship, see for example Montgomery, The Kurds of Syria, 2005, p. 130ff. PKK sympathizers were very disproportionately targeted by state repression in the 2000–2010 period, far beyond their expected share as the largest Kurdish organization in Syria. Before 2011, the Kurdish political scene in Syria was made up of approximately sixteen political parties, but two thirds of all cases of conviction for illegal party activism in 2009 concerned PKK sympathizers. “Human-rights violations since 2009,” KurdWatch, February 14, 2012, www.kurdwatch.org/statistics/statistics_en.html. In several interviews conducted by the author with party representatives in 2011, 2012, and 2013—including Saleh Muslim Mohammed, who was at that time the party chairman—the PYD firmly denied having reached any sort of understanding with the Syrian government. Abdelqader Saleh interviewed by Ahmed Zeidan on the program Liqa al-Yawm, Al Jazeera, August 11, 2012. Yasser Munif, “Participatory Democracy and Micropolitics in Manbij: An Unthinkable Revolution,” The Century Foundation, February 21, 2017, https://tcf.org/content/report/participatory-democracy-micropolitics-manbij. Aron Lund, “Syrian Jihadism,” UI Brief No. 13, Swedish Institute for International Affairs, September 14, 2012, available at www.sultan-alamer.com/wp-content/uploads/77409.pdf. Author’s interview with expat Syrian businessman from Aleppo, 2013. Most of Lafarge’s 130-something foreign employees were Egyptians originally hired by Orasom Cement. By mid-2012, many were concerned about the security situation and wanted to leave. Most of the administrative staff in Damascus transferred their operations to Cairo after summer 2012. Other expats, including French citizens, were also evacuated. The Chinese workers at the coal plant left last of all, in December 2012. The Chinese contractor hired by LCS had refused to cooperate and tried to stall evacuation for as long as possible, fearing that leaving Syria would mean losing their contract. The final evacuation was a bizarre event, in which Wærness and a rebel commander he had hired for facilitation and protection managed to smuggle the last seventeen Chinese workers all the way to the border post in rebel-held Jarablous and then talked their way past a group of baffled Turkish border guards. Wærness, Risikosjef i Syria, 2016, p. 155; Wærness, interview, 2017. Wærness, Risikosjef i Syria, 2016, p. 172. Purported Syrian government records leaked to the opposition newspaper Zaman al-Wasl would later be found to include Wærness’s name among those of seventy-five Norwegian citizens wanted for arrest. Kristian Elster, Christine Svendsen, and Mohammed Alayoubi, “Jacob (39) står på Assads arrestliste,” Norwegian Public Radio, June 28, 2016, https://www.nrk.no/urix/jacob-_39_-star-pa-assads-arrestliste-1.13579665. The group initially called itself the Desert Hawks (Suqour al-Sahra) but later claimed to be part of a larger Free Syrian Army coalition known as the Justice Brigade (Liwa al-Haqq). Wærness, Risikosjef i Syria, 2016, p. 106ff. A ransom letter from the Justice Brigade is found in facsimile in the book (illustrations section, p. 14) and in Norwegian translation on p. 112. According to Wærness, FSA groups involved in the kidnapping included the Qaaqaa Brigade (run betwby a man called Aboul-Nour), which seems to have been based in either Jarablous or Manbij, and several Manbij-based groups: Yarmouk Brigade (run by Abu Khaled al-Bakkari), the Nouman Battalion, and the Abu Ayyoub al-Ansari Battalion, in addition to at least some members of the Manbij Revolutionary Council. Some of these names have also been used by unrelated groups, which were not involved in the kidnapping. Wærness, Risikosjef i Syria, 2016, p. 106ff, 143. In his book, Wærness writes that one of the kidnapped employees was a nephew of the first wife of Deputy Defense Minister Asef Shawkat, killed some months prior in Damascus. General Shawkat’s second wife was Bashar al-Assad’s older sister Bushra, which accounted for his rise in the military after their marriage in 1994. The long-since estranged ex-wife was not influential in the regime, and the rebels finally accepted this. Wærness, Risikosjef i Syria, 2016, p. 130. According to the Financial Times, LCS paid €220,000 to free the hostages. Wærness mentions a sum of 25 million in Syrian pounds, of which he says an LCS-contracted hostage negotiator (Mohammed al-Manbeji, of the Free Syrian Army’s Manbij Military Council) stole 9 million. Beat Werder, a Lafarge spokesperson, declined to comment on the topic of ransom payments, citing security concerns. Wærness, Risikosjef i Syria, 2016, p. 125ff; Ralph Atkins, Erika Solomon, and Michael Stothard, “LafargeHolcim’s reputation at risk over alleged links with Isis,” Financial Times, March 19, 2017, https://www.ft.com/content/406b06fe-05b6-11e7-aa5b-6bb07f5c8e12; Wærness, interview, 2017; Author’s interview with Beat Werder, head of media relations at LafargeHolcim, phone, December 2017. All quotes from author’s interview with Wærness, 2017. For information on the meeting with the kidnappers, see Wærness, Risikosjef i Syria, 2016, p. 14ff, 136ff. According to Wærness (p. 220), a total of thirteen LCS workers or others linked to the factory were kidnapped between August 2012 and September 2013. Author’s interview with a source informed about the Tlass family’s affairs, 2016. Author’s interview with military defector from Rastan, Stockholm, 2016. Manaf Tlass reportedly protested some of the tactics used by government forces, viewing them as unnecessarily abusive and counter-productive. In his role as commander of the 104th Brigade of the Republican Guard, which was stationed in Damascus, he attempted to organize negotiations with demonstrators and religious leaders in the areas he was assigned to handle, which included Douma and other territories around the capital, but apparently not Rastan. He appears to have felt snubbed by Assad and was angered when the president allowed other commanders to intrude on “his” areas, disrupting talks by arresting opposition negotiators. By late 2011 or early 2012, Manaf Tlass had been sidelined in favor of the deputy commander of the 104th Brigade, Colonel Essam Zahreddine, who later took formal command of the unit after Tlass’s defection. “Syrian general close to Assad defects,” Al Jazeera, July 6, 2012, https://www.aljazeera.com/news/middleeast/2012/07/201276533461952.html. Mohammed Nassar, “rajl al-aamal firas tlas: 45 dabitan min ailati inshaqqou an al-nizam.. wa-walidi ‘hazin wa-samet,” al-Sharq al-Awsat, July 13, 2012, archive.aawsat.com/details.asp?section=4&article=686212&issueno=12281; Ruth Sherlock, “One of Syria’s richest men to help fund a rebel army,” Daily Telegraph, September 27, 2012, www.telegraph.co.uk/news/worldnews/middleeast/syria/9571297/One-of-Syrias-richest-men-to-help-fund-a-rebel-army.html. “Veteran Syrian defense minister Tlass dies in Paris at 85,” Reuters, June 27, 2017, https://www.reuters.com/article/us-mideast-crisis-syria-tlass/veteran-syrian-defense-minister-tlass-dies-in-paris-at-85-idUSKBN19I2L. “bil-asma: al-hajz ala amwal rijal wa-sayyedat aamal souriyin bi-tuhum tamwil al-irhab,” al-Iqtisadi, November 3, 2012, https://aliqtisadi.com/41981-بالأسماء-الحجز-على-أموال-رجال-وسيدات-أ/ . In 2013, a Syrian anti-terrorist court was additionally reported to have ordered the expropriation of MAS and sentenced Firas Tlass to death in absentia. “mahkamat al-irhab fi souriya tasdar ahkaman bi-iedam naib al-rais al-souri al-asbaq wa-najl wazir al-difaa al-souri al-asbaq,” DamPress, June 15, 2013, www.dampress.net/?page=show_det&category_id=6&CatId=0&id=28690&lang=ar. LafargeHolcim head of media relations Beat Werder tells me Tlass remained on the board of LCS until the beginning of 2014 (email, January 2018). According to an internal investigation commissioned by Lafarge, MAS received payments. The Syrian government viewed the plant both as a source of regular income, through taxes and fees, and as a strategic asset for the future, particularly when it came to post-war reconstruction. Keeping a large European company in Syria could also be useful to the government, and Wærness notes that the Syrian government was keen to preserve the factory as “a way to maintain a relationship to France even though all diplomatic ties had been cut.” Wærness, Risikosjef i Syria, 2016, p, 85. “In so far as the rebels were willing to work with Firas Tlass, it was mostly for economic reasons,” says Jacob Wærness, who relied on Tlass to find contacts among the insurgent groups in northern Syria. “He didn’t have a lot of political authority and his reputation among the rebel groups was not great. They were loyal to him as long as he paid them, but he was considered an opportunist.” Wærness, interview, 2017. Renaud Lecadre, “Firas Tlass, «partenaire local» de Lafarge en Syrie,” Libération, December 14, 2017, www.liberation.fr/france/2017/12/14/firas-tlass-partenaire-local-de-lafarge-en-syrie_1616777. The 2012 annual report of the General Establishment of Geology and Mineral Resources, which is available on its website, lists three deals with Lafarge in 2012. One, concluded on January 4, 2012, concerned an order for 650,000 tons of volcanic ash worth 216.5 million Syrian pounds (roughly $3m at the time) from the al-Manakher quarry east of Raqqa. The 2013 annual report is not available on the website. The 2014 report lists the al-Manakher quarry as inactive. See www.geology-sy.org. According to Wærness, Risikosjef i Syria, 2016, p. 116ff, the following factions were present at the hotel: the Manbij Military Council, represented by Mohammed al-Manbiji; the Aleppo Political Council, represented by Saad Wafai; the Supreme Military Council of the Free Syrian Army, a constellation of Free Syrian Army-branded factions with foreign backing, represented by Louai al-Meqdad; the Fateh Brigade, which was represented by Nour al-Hilal Abu Bakr; and the Suqour al-Shahba Brigade, which was led by Mohammed Tlass, a nephew of Firas. Wærness says he and his LCS colleagues felt that these were Free Syrian Army-branded factions that were also in contact with the American, British, and French governments, and that they seemed risk-free to work with—at least in terms of sanctions. The company declined proposals to meet with groups they knew to be designated as terrorists. “A representative from Islamic State asked me through an intermediary whether I wanted to meet with them in the summer of 2013, but we felt that wouldn’t be right.” Wærness, interview, 2017. “Our policy was to never pay money directly to these groups. I never gave money to any rebel faction, with the exception of when I ransomed the nine employees taken hostage and in return for a few specific services, such as providing armed escorts for a transport. In those cases, we signed deals and money was handed over in return for receipts. Those were moderate rebel groups based in Manbij or Jarablous.” Wærness, interview, 2017. Wærness, interview, 2017: Soren Seelow, “Lafarge en Syrie : trois cadres du cimentier mis en examen,” Le Monde, December 1, 2017, www.lemonde.fr/societe/article/2017/12/01/lafarge-en-syrie-trois-cadres-mis-en-examen_5223444_3224.html. Soren Seelow, “Lafarge en Syrie : trois cadres du cimentier mis en examen,” Le Monde, December 1, 2017, www.lemonde.fr/societe/article/2017/12/01/lafarge-en-syrie-trois-cadres-mis-en-examen_5223444_3224.html. “Les dessous du pacte entre Lafarge et Daech en Syrie,” Capital, October 6, 2017, https://www.capital.fr/entreprises-marches/les-dessous-du-pacte-de-lafarge-avec-le-groupe-etat-islamique-en-syrie-1248310. The Nusra Front, a Syrian Salafi-jihadi group created in late 2011 and officially unveiled in January 2012, was initially a front organization for the jihadi group then known as the Islamic State of Iraq, which functioned as al-Qaeda’s local partner in Iraq. After growing tension between the Syrian and Iraqi leaderships, the Islamic State of Iraq sought to take full ownership of the Nusra Front in April 2013 by declaring a cross-border merger, which was to be known as the Islamic State of Iraq and the Levant (ISIL). This led to a worsening conflict with Syrian and international supporters of al-Qaeda, who refused to accept the merger and endorsed a Syria-only rump faction of the Nusra Front. The two groups have been openly at war since early 2014. After seizing Mosul and other areas in summer 2014, ISIL declared itself a caliphate and shortened its name to simply the Islamic State. The Nusra Front changed its name to Fateh al-Sham in 2016 and to Tahrir al-Sham in 2017, announcing that it had cut ties with al-Qaeda. Author’s interview with Ibrahim al-Idlebi, director of the Ahfad al-Rasoul Brigades’ media office, Skype, June 2013. For more about the groups that seized Raqqa, see Matthew Barber, “The Raqqa Story: Rebel Structure, Planning, and Possible War Crimes,” Syria Comment, April 4, 2013, www.joshualandis.com/blog/the-raqqa-story-rebel-structure-planning-and-possible-war-crimes. Alison Tahmizian Meuse, “In Raqqa, Islamist Rebels Form a New Regime,” News Deeply, August 16, 2013, https://www.newsdeeply.com/syria/articles/2013/08/16/in-raqqa-islamist-rebels-form-a-new-regime. “Islamists execute up to 100 rivals as Raqqa falls from control of Western-backed rebels,” Reuters/The Telegraph, January 13, 2014, www.telegraph.co.uk/news/worldnews/middleeast/syria/10568223/Islamists-execute-up-to-100-rivals-as-Raqqa-falls-from-control-of-Western-backed-rebels.html. Much of the money was likely intended as payment for raw materials or other services rendered, with only part of the total sum benefiting armed groups directly. According to the satirical French newspaper Le Canard enchaîné, Lafarge’s internal investigations concluded that LCS paid a total of $5.56 million to Syrian armed groups between July 2012 and September 2014, of which the Islamic State ended up with $509,694. It is not obvious to me how these numbers could be reconciled with figures in the reported internal probe, and they may relate to other findings. Yannick Vely, “Le groupe Lafarge aurait versé plus de 500 000 dollars à l’Etat islamique,” Paris Match, November 23, 2017, www.parismatch.com/Actu/International/Le-groupe-Lafarge-aurait-verse-plus-de-500-000-dollars-a-l-Etat-islamique-1400795. For example, two allegedly Islamic State-connected suppliers of oil and pozzolanic ash in Raqqa, Ahmed Jamal and Mohammed al-Tawil, reportedly began receiving payments in October and November 2013. Payments from LCS to these two men would total some $2.5 million over the coming year. The arrangement appears to have involved a Syrian-Canadian businessman named Amro Taleb, who is listed in documents reportedly originating with an internal probe as a “[f]ormer LCS consultant and self-acknowledged IS intermediary,” who received in excess of $220,000 from LCS. The base-level salary paid by the United States and its allies to Free Syrian Army-branded factions was around $150 per man and month, though commanders could make more. U.S.-backed rebels fighting the Islamic State received $250–400 per month in 2015. Islamic State fighters were often said to receive higher salaries, with one report citing a $400–600 monthly salary for fighters in 2014. However, internal Islamic State documents collected by Aymenn al-Tamimi, an expert on the group’s bureaucracy, indicate a considerably lower base salary of $50 in 2015 and 2016, though that figure could be increased through family allowances. Mariam Karouny, “In northeast Syria, Islamic State builds a government,” Reuters, September 3, 2014, https://www.reuters.com/article/us-syria-crisis-raqqa-insight/in-northeast-syria-islamic-state-builds-a-government-idUSKBN0GZ0D120140904; David Alexander, “U.S. military pays Syrian rebels up to $400 per month: Pentagon,” June 22, 2015, https://www.reuters.com/article/us-mideast-crisis-syria-usa/u-s-military-pays-syrian-rebels-up-to-400-per-month-pentagon-idUSKBN0P22BX20150622; Aymenn Jawad al-Tamimi, “Specimen 14U: Salary scheme table for the Al-Bara’ bin Malek Battalion members,” Archive of Islamic State Administrative Documents (cont. ), January 11, 2016, www.aymennjawad.org/2016/01/archive-of-islamic-state-administrative-documents-1; Aymenn Jawad al-Tamimi, “A Caliphate under Strain: The Documentary Evidence,” CTC Sentinel, April 22, 2016, https://ctc.usma.edu/posts/a-caliphate-under-strain-the-documentary-evidence; Erika Solomon, “The rise and fall of a US-backed rebel commander in Syria,” Financial Times, February 9, 2017, https://www.ft.com/content/791ad3bc-ecfc-11e6-930f-061b01e23655. See also Aron Lund, “A Fistful of Dollars: The Dwindling Value of Syrian State Salaries,” The Century Foundation, May 13, 2016, https://tcf.org/content/commentary/fistful-dollars-dwindling-value-syrian-state-salaries. Wærness, Risikosjef i Syria, 2016, p. 232. 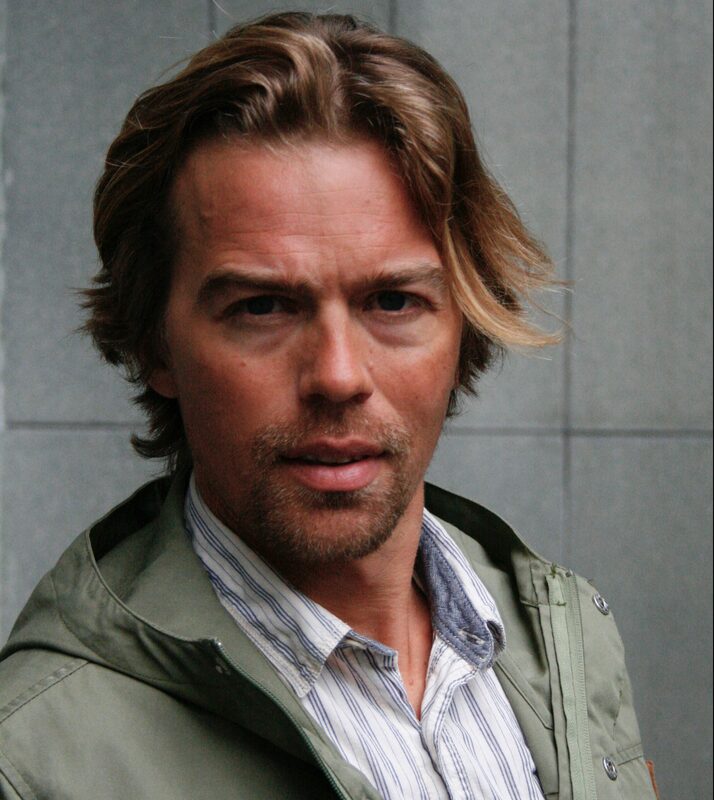 Wærness, Risikosjef i Syria, 2016, p. 172; Camilla Botilsrud Sagen, “Norske Jacob (38) er ettersøkt av IS,” Norwegian Television Channel 2, September 8, 2016, www.tv2.no/a/8569592. Kristian Elster, Christine Svendsen, and Mohammed Alayoubi, “Jacob (39) står på Assads arrestliste,” Norwegian Public Radio, June 28, 2016, https://www.nrk.no/urix/jacob-_39_-star-pa-assads-arrestliste-1.13579665. Now based in Zürich, Wærness has gone on to work as a consultant on business development and country security risk in the Middle East and Africa. His book, Risikosjef i Syria: På jobb mellom regime, opprørere og IS (“Risk Manager in Syria: Working between the Regime, the Rebels, and the IS”) was published by Pax, a Norwegian publisher, in August 2016. Sources speaking to Zaman al-Wasl said “the relationship between LCS and various armed groups around the factory was old, and that the one who laid its foundation was the Norwegian risk director Jacob. However, the one to fasten [رسخ] the relationship with the [Islamic State] organization was the Jordanian risk director Ahmed, who was appointed as Jacob’s successor in 2013.” Ithar Abdelhaqq, “bil-mustanadat wal-shahadat .. ‘zaman al-wasl’ taftah milaff alaqa akbar sharikat lil-asment fil-alam bi-tanzim al-dawla (j. 1),” Zaman al-Wasl, February 18, 2016, https://www.zamanalwsl.net/news/article/68841. See also Le Monde, which draws on the same set of documents: “Comment le cimentier Lafarge a travaillé avec l’Etat islamique en Syrie,” Le Monde, June 21, 2016, www.lemonde.fr/proche-orient/article/2016/06/21/comment-le-cimentier-lafarge-a-travaille-avec-l-etat-islamique-en-syrie_4955039_3218.html. “He was a member of the board of the company in Syria and his shareholdings were around 1 percent. He left the board at the beginning of 2014,” I was told by LafargeHolcim’s head of media relations, Beat Werder, who added that Tlass “has no shareholdings anymore. There is no relationship anymore.” Werder, interview, 2017. “al-hukuma al-souriya tusadir malkiyat firas tlass fi maamal lafarj,” al-Iqtisadi, August 21, 2014, https://aliqtisadi.com/441326-نقل-مكلية-فراس-طلاس-بلافارج-سورية. “As things became more like, you know, the Wild West, with rebels taking over the border crossings and so forth, you started seeing cement coming in from Turkey. It had previously been illegal to import cement to Syria—I guess it still is—and that gave local producers a market monopoly. Over time, the rebels figured out that cement sold much more cheaply in southern Turkey, where local factories had surplus capacity. So they started importing cement from Turkey. In the beginning, the Turkish trucks had a backload, making the business even more profitable. The drivers filled the tanks with subsidized gasoline in Syria which they sold at a premium back in Turkey. […] The import of cement put pressure on prices, reducing our margins as production costs rose. Keeping the factory open was never good business, it was more about reducing the losses and preventing the property from being destroyed.” Wærness, interview, 2017. Yazigi, email to author, 2017. “ISIL recaptures Raqqa from Syria’s rebels,” Al Jazeera, January 14, 2014, www.aljazeera.com/news/middleeast/2014/01/isil-recaptures-raqqa-from-syrias-rebels-2014114201917453586.html; Yasser Munif, “Participatory Democracy and Micropolitics in Manbij: An Unthinkable Revolution,” The Century Foundation, February 21, 2017, https://tcf.org/content/report/participatory-democracy-micropolitics-manbij. Aron Lund, “Who Are the Soldiers of the Islamic State?” Carnegie Endowment for International Peace, October 24, 2014, carnegie-mec.org/diwan/57021?lang=en. David Doyle, “Islamic State video shows Assad army base massacre,” Channel 4 News, September 9, 2014, https://www.channel4.com/news/islamic-state-isis-raqqa-syria-battle-video-propaganda. “Battle for Kobane: Key events,” BBC, June 25, 2015, www.bbc.com/news/world-middle-east-29688108. Chris Johnston, “Turkey opens border to 45,000 Kurds fleeing Isis militants in Syria,” The Guardian, September 21, 2014, https://www.theguardian.com/world/2014/sep/20/turkey-opens-borders-45000-kurds-fleeing-isis-syria. Ralph Atkins, Erika Solomon, and Michael Stothard, “LafargeHolcim’s reputation at risk over alleged links with Isis,” Financial Times, March 19, 2017, https://www.ft.com/content/406b06fe-05b6-11e7-aa5b-6bb07f5c8e12. “tahrir maamel al-shalabiyya [sic],” propaganda video released by the Islamic State’s Raqqa Province, n.d., copy in author’s possession. Waerness notes that a fuel tank was set ablaze in connection with the attack, likely by the YPG. Waerness, Risikosjef i Syria, 2016, p. 244. “Lafarge evacuates Syrian plant on security grounds,” Reuters, September 25, 2014, https://www.reuters.com/article/us-syria-crisis-lafarge/lafarge-evacuates-syrian-plant-on-security-grounds-idUSKCN0HK0X420140925. Wærness, Risikosjef i Syria, 2016, p. 243. Aron Lund, “Why the Victory in Kobane Matters,” Carnegie Endowment for International Peace, February 13, 2015, carnegie-mec.org/diwan/59061. Author’s interview with Jesper Söder, who was at the time a Swedish volunteer fighter with the YPG, January 2018. Aron Lund, “Taking the October Dam: Syria’s Kurds Keep Hitting the Islamic State,” Carnegie Endowment for International Peace, December 28, 2015, carnegie-mec.org/diwan/62363?lang=en; Aron Lund, “Manbij: A Dress Rehearsal for Raqqa?,” Carnegie Endowment for International Peace, August 10, 2016, carnegie-mec.org/diwan/64270?lang=en; Aron Lund, “The Islamic State Is Collapsing, but Raqqa Is in Ruins,” The Century Foundation, October 18, 2017, https://tcf.org/content/commentary/islamic-state-collapsing-raqqa-ruins. Benjamin Barthe, Allan Kaval, and Madjid Zerrouky, “L’usine Lafarge en Syrie est devenue une base des forces spéciales occidentales,” Le Monde, June 21, 2016, www.lemonde.fr/international/article/2016/06/21/l-usine-lafarge-en-syrie-est-devenue-une-base-des-forces-speciales-occidentales_4955033_3210.html. Post on Twitter by Tahrir Souri, March 6, 2017, https://twitter.com/TahrirSy/status/838839261185126402; author’s interviews with anonymous sources. Ithar Abdelhaqq, “bil-mustanadat wal-shahadat .. ‘zaman al-wasl’ taftah milaff alaqa akbar sharikat lil-asment fil-alam bi-tanzim al-dawla (j. 1),” Zaman al-Wasl, February 18, 2016, https://www.zamanalwsl.net/news/article/68841. “Comment le cimentier Lafarge a travaillé avec l’Etat islamique en Syrie,” Le Monde, June 21, 2016, www.lemonde.fr/proche-orient/article/2016/06/21/comment-le-cimentier-lafarge-a-travaille-avec-l-etat-islamique-en-syrie_4955039_3218.html. “French company Lafarge sued for Financing ISIS and Complicity in War Crimes and Crimes Against Humanity in Syria,” Sherpa, November 15, 2016, https://www.asso-sherpa.org/french-company-lafarge-sued-for-financing-isis-and-complicity-in-war-crimes-and-crimes-against-humanity-in-syria-2. Jean-Yves Guérin and Bertille Bayart, “LafargeHolcim dans la tourmente de ses anciennes affaires syriennes,” Le Figaro, December 3, 2017, http://www.lefigaro.fr/societes/2017/12/03/20005-20171203ARTFIG00189-lafargeholcim-dans-la-tourmente-de-ses-anciennes-affaires-syriennes.php. “Of course, it is easy to say with hindsight,” LafargeHolcim chairman Beat Hess told Le Figaro in early December, “but [the company] certainly took too long to withdraw from Syria. All of this should have been avoided.” Bertille Bayart and Jean-Yves Guérin, “Beat Hess: «Il y a eu des erreurs inacceptables que LafargeHolcim regrette et condamne»,” Le Figaro, December 3, 2017, http://www.lefigaro.fr/societes/2017/12/03/20005-20171203ARTFIG00175-beat-hess-il-y-a-eu-des-erreurs-inacceptables-que-lafargeholcim-regrette-et-condamne.php. See also company statements on this subject: “Précisions de LafargeHolcim sur ses opérations en Syrie,” Lafarge, November 16, 2016, https://www.lafarge.fr/precisions-lafargeholcim-operations-syrie; “Réponse de LafargeHolcim à l’enquête sur la Syrie,” Lafarge, March 2, 2017, https://www.lafarge.fr/reponse-de-lafargeholcim-a-lenquete-sur-la-syrie. Bertille Bayart, “Le patron de LafargeHolcim quitte le groupe,” Le Figaro, April 24, 2017, http://www.lefigaro.fr/societes/2017/04/22/20005-20170422ARTFIG00113-le-patron-de-lafargeholcim-proche-du-depart.php; John Revill and Oliver Hirt, “CEO to go after LafargeHolcim admits paying Syrian groups,” Reuters, April 24, 2017, https://www.reuters.com/article/us-lafargeholcim-syria-olsen/ceo-to-go-after-lafargeholcim-admits-paying-syrian-groups-idUSKBN17Q0E4. “France’s Lafarge paid Daesh to continue operating in Syria, former employees say,” AFP/Daily Sabah, September 22, 2017, https://www.dailysabah.com/syrian-crisis/2017/09/22/frances-lafarge-paid-daesh-to-continue-operating-in-syria-former-employees-say. “al-imarat taataqel firas tlas ala khalfiya qadiyat ’lafarge’,” al-Iqtisad, October 19, 2017, https://www.eqtsad.net/read/18207; Abderrazzaq al-Nabhan, “anba an ietiqal al-imarat najl wazir al-difaa al-souri al-sabiq,” al-Quds al-Arabi, October 19, 2017, www.alquds.co.uk/?p=811427; “tawqif firas tlass fil-imarat: ishtibah bi-tamwil ’al-irhab’,” Al-Modon, October 20, 2017, www.almodon.com/arabworld/2017/10/20/توقيف-فراس-طلاس-في-الإمارات-اشتباه-بتمويل-الإرهاب; “Police search Lafarge headquarters as part of Syria investigation,” RFI, November 14, 2017, en.rfi.fr/france/20171114-police-search-lafarge-headquarters-part-syria-investigation. One Syrian source (author’s interview, February 2017) claimed that Tlass’s legal troubles may have been related to his affairs in the United Arab Emirates, or possibly to that and to the Lafarge case simultaneously. According to a news report in February 2018, the charges against Tlass related to passport forgery. This also matches legal documents provided to me by a source linked to Tlass in February 2018. Al-Jadeed TV, evening newscast with George Salibi and Shadi Khalife, February 3, 2018, https://youtu.be/WQVdU6eDD_I. Firas Tlass could not be reached for comment during the writing of this report, as he appears to have been under arrest since October 2017. The Lafarge executives reported to be under investigation are: Bruno Pescheaux, CEO of LCS in 2008-2014; Frédéric Jolibois, briefly CEO of LCS in 2014; Jean-Claude Veillard, Lafarge’s Paris-based security director; Bruno Lafont, the CEO of Lafarge 2007-2015; Christian Herrault, Lafarge’s former deputy CEO; and Eric Olsen, CEO of LafargeHolcim 2015-2017. Soren Seelow, “Lafarge en Syrie : trois cadres du cimentier mis en examen,” Le Monde, December 1, 2017, www.lemonde.fr/societe/article/2017/12/01/lafarge-en-syrie-trois-cadres-mis-en-examen_5223444_3224.html; “Lafarge en Syrie : deux responsables, dont l’ex-PDG Bruno Lafont, mis en examen,” AFP/Libération, December 8, 2017, http://www.liberation.fr/france/2017/12/08/lafarge-en-syrie-deux-responsables-dont-l-ex-pdg-bruno-lafont-mis-en-examen_1615514; David Keohane, “Ex-LafargeHolcim CEO under investigation in Syria terrorist financing probe,” Financial Times, December 8, 2017, https://www.ft.com/content/387a89cf-c304-3d85-8261-b070c3408e4d. Nour Samaha, “The Black Market Kings of Damascus,” The Atlantic, October 3, 2016, https://www.theatlantic.com/international/archive/2016/10/syria-war-economy-damascus-assad/502304; Nour Samaha, “Elites, War Profiteers Take Aim at Syria’s Economic Future,” Syria Deeply, September 18, 2017, https://www.newsdeeply.com/syria/articles/2017/09/18/long-read-elites-war-profiteers-take-aim-at-syrias-economic-future. Samer Abboud, “The Economics of War and Peace in Syria: Stratification and Factionalization in the Business Community,” The Century Foundation, January 31, 2017, https://tcf.org/content/report/economics-war-peace-syria. Email to the author from Samer Abboud, December 2017. Samer N. Abboud, Syria (Cambridge, UK: Polity, 2015). For example, Aleppo parliamentarian and grain merchant Hossam al-Katerji has reportedly become a major actor in the wheat trade between eastern Syria and the Assad-controlled west, where authorities remain involved with the cereal market through state-subsidized prices and regulations. Another Damascus businessman, Mohyeddine Manfoush, is said to have grown wealthy during the war by brokering trade deals between military leaders and insurgents in the Ghouta region, exploiting the price spikes created by a government siege. Michael Georgy and Maha El Dahan, “How a businessman struck a deal with Islamic State to help Assad feed Syrians,” Reuters, October 11, 2017, https://www.reuters.com/article/us-mideast-crisis-syria-wheat-islamic-st/how-a-businessman-struck-a-deal-with-islamic-state-to-help-assad-feed-syrians-idUSKBN1CG0EL; Aron Lund, “Into the Tunnels: The Rise and Fall of Syria’s Rebel Enclave in the Eastern Ghouta,” The Century Foundation, December 21, 2016, https://tcf.org/content/report/into-the-tunnels; Aron Lund, “The man-made disaster in Syria’s Eastern Ghouta,” IRIN News, December 19, 2017, https://www.irinnews.org/analysis/2017/12/19/man-made-disaster-syria-s-eastern-ghouta. “EU accuses Syrian man of buying IS oil for govt; he denies charge,” Reuters, March 8, 2015, https://www.reuters.com/article/us-syria-crisis-eu/eu-accuses-syrian-man-of-buying-is-oil-for-govt-he-denies-charge-idUSKBN0M40E.Q20150308; Erika Solomon, “Isis Inc: Syria’s ‘mafia-style’ gas deals with jihadis,” Financial Times, October 15, 2015, https://www.ft.com/content/92f4e036-6b69-11e5-aca9-d87542bf8673. Erika Solomon, “Isis Inc: Syria’s ‘mafia-style’ gas deals with jihadis,” Financial Times, October 15, 2015, https://www.ft.com/content/92f4e036-6b69-11e5-aca9-d87542bf8673. “Treasury Sanctions Networks Providing Support to the Government of Syria, Including For Facilitating Syrian Government Oil Purchases from ISIL,” U.S. Department of the Treasury, November 25, 2015, https://www.treasury.gov/press-center/press-releases/Pages/jl0287.aspx; David Blair, “Oil middleman between Syria and Isil is new target for EU sanctions,” Daily Telegraph, March 7, 2015, www.telegraph.co.uk/news/worldnews/islamic-state/11455602/Oil-middleman-between-Syria-and-Isil-is-new-target-for-EU-sanctions.html. The EU later annulled some, but not all, sanctions on Heswani. See Maya Lester, “Syrian sanctions on George Haswani annulled,” European Sanctions, March 22, 2017, https://europeansanctions.com/2017/03/22/syrian-sanctions-on-george-haswani-annulled. The sanctioning of Heswani was “yet another indication that Assad’s ’war’ on ISIL is a sham and that he supports them financially,” claimed U.K. Foreign Secretary Phillip Hammond in March 2015. “UK welcomes new EU Syria sanctions listings,” U.K. Foreign and Commonwealth Office, March 7, 2015, https://www.gov.uk/government/news/uk-welcomes-new-eu-syria-sanctions-listings. “They sell oil. He buys oil. They are symbiotic, not real enemies in this,” said U.S. Secretary of State John Kerry in November 2015, referring to the Islamic State and Assad. “Press Availability with Russian Foreign Minister Sergey Lavrov and UN Special Envoy Staffan de Mistura,” U.S. Department of State, November 14, 2015, https://2009-2017.state.gov/secretary/remarks/2015/11/249515.htm. For one example of many, Turkish- and Western-backed rebels in the Aleppo-Idlib region had negotiated a semi-permanent fuel-for-food trade with Islamic State-controlled oil fields in eastern Syria, which remained in operation for at least a couple of years. In 2016, the YPG muscled Ankara-friendly factions out of the trade, imposing themselves as middlemen between two sets of pro-Turkish Arab rebels in Idlib and north of Aleppo, taxing Islamic State oil and rebel-sourced food as it passed from one to the other. See Noura Hourani and Orion Wilcox, “YPG blocks trucks transporting fuel into rebel-held northwest, creating shortage,” Syria Direct, May 19, 2016, syriadirect.org/news/ypg-blocks-trucks-transporting-fuel-into-idlib-province-creating-shortage; Mohamed al-Haj Ali et al, “New north Aleppo route ends fuel crisis, bypasses Azaz rebels,” Syria Direct, May 26, 2016, http://syriadirect.org/news/new-north-aleppo-route-ends-fuel-crisis-bypasses-azaz-rebels. “Humanitarian Needs Overview 2018,” United Nations/OCHA, November 2017, https://reliefweb.int/sites/reliefweb.int/files/resources/2018_syr_hno_english.pdf. On the Syrian diaspora and how it relates to its homeland, see Lily Hindy and Sima Ghaddar, “A ’Nation in Pieces’: Views from Syrians in Exile,” The Century Foundation, November 30, 2017, https://tcf.org/content/report/nation-pieces-views-syrians-exile. Omer Karasapan, “Rebuilding or redefining Syria?,” Brookings Instituttion, February 13, 2017, https://www.brookings.edu/blog/future-development/2017/02/13/rebuilding-or-redefining-syria; “President Assad issues law on 2018 state budget set at SYP 3,187 billion,” Syrian Arab News Agency, December 10, 2017, https://sana.sy/en/?p=120756. Rebels were besieged in the Old City of Homs until 2014, and previously controlled other areas as well, such as the Baba Amr suburb. The outlying western suburb of Waer remained in rebel hands after the taking of Homs proper, and was not captured until 2017. Dahlia Nehme, “Syrian city’s rebel districts still in ruins years after Assad victory,” Reuters, August 18, 2017, https://www.reuters.com/article/us-mideast-crisis-syria-homs/syrian-citys-rebel-districts-still-in-ruins-years-after-assad-victory-idUSKCN1AY16X; Bassem Mroue, “Nearly 4 years on, much of Syrian rebel ‘capital’ abandoned,” Associated Press, January 17, 2018, https://apnews.com/47d8152311734f11915727652f1e5b42. Author’s interview with Perwar Mohammed Ali, Syrian Democratic Forces media official, phone, October 2017. “Humanitarian Needs Overview 2018,” United Nations/OCHA, November 2017, https://reliefweb.int/sites/reliefweb.int/files/resources/2018_syr_hno_english.pdf; Aron Lund, “The Islamic State Is Collapsing, but Raqqa Is in Ruins,” The Century Foundation, October 18, 2017, https://tcf.org/content/commentary/islamic-state-collapsing-raqqa-ruins; Aron Lund, “Winter is coming: Who will rebuild Raqqa?” IRIN News, October 23, 2017, https://www.irinnews.org/analysis/2017/10/23/winter-coming-who-will-rebuild-raqqa; “Displaced Syrians survive war but face battle against cold,” AFP/The National, December 26, 2017, https://www.thenational.ae/world/mena/displaced-syrians-survive-war-but-face-battle-against-cold-1.690650. Rex W. Tillerson, “Remarks on the Way Forward for the United States Regarding Syria,” U.S. Department of State, January 17, 2018, https://www.state.gov/secretary/remarks/2018/01/277493.htm. “Press Gaggle with Secretary Mattis,” U.S. Department of Defense, December 29, 2017, https://www.defense.gov/News/Transcripts/Transcript-View/Article/1406278/press-gaggle-with-secretary-mattis; Joanne Stocker, “Coalition retraining 15,000 veteran SDF fighters to serve as Syrian border force,” Defense Post, January 13, 2018, https://thedefensepost.com/2018/01/13/syria-border-security-force-sdf-coalition. “Saudi minister visits north Syria for Raqqa talks,” Reuters, October 19, 2017, https://www.reuters.com/article/us-mideast-crisis-syria-coalition/saudi-minister-visits-north-syria-for-raqqa-talks-idUSKBN1CO2HG. In its last annual report before the July 2015 merger with Holcim, Lafarge said the camp seemed to have sustained only “minor damages.” The company proclaimed itself “firmly committed to restart its operations as soon as the situation will allow it.” Lafarge annual report 2014, English version, www.lafarge.com/sites/default/files/atoms/files/03232015-press_publication-2014_annual_report-uk.pdf. According to Waerness, “the production line at the factory appears undamaged, the greatest destruction being in the power plant and a large fuel tank that was set ablaze when the IS moved west [in September 2014], presumably by the YPG to prevent the fuel from falling in IS hands.” Waerness, Risikosjef i Syria, 2016, p. 244. A spokesperson for the Syrian Democratic Forces, the U.S.-backed alliance through which the YPG now operates, did not respond to calls or messages requesting comment.